What a greatly amusing film. Director Andrew Stanton (Finding Nemo, A Bug’s Life) has created one of the very best animated films of all time. The dazzling visual style of Wall•E is worth the price of admission; this is truly a film to be loved by all. Earth is dead. Rotted away hundreds of years ago, it remains a ruins for skyscraper-high piles of trash. Wall•E, a mini-trash compactor, is all that’s left. Who knows how long his been around by himself. He doesn’t seem to mind. He wanders through day by day, doing his job and collecting American mementos to entertain himself at night. 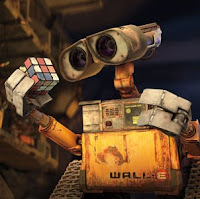 The first half of Wall•E are nearly free of dialogue, and it is the best part of the movie. There are some genuine laughs to be had (by all ages) in watching this little machine breeze his way through existence. Soon, a monstrous rocket ship lands, delivering the sleek EVE to scan the planet for life. EVE looks like a giant iPod, smooth and glistening white (obviously a female), and it doesn’t take long for Wall-E to fall for her. Wall•E ends up following EVE into space to a huge space station where earthlings have lived for centuries. Stanton does a funny thing with this new “people”. He depicts him as lazy (the rarely get up from their moving chairs) and fat (hundreds of years of bone growth due to the gravity shift). The space scenes are fun, and offer more laughs for the kids, but you’ll soon wish we were back on the ground. Regardless, Wall-E is a character with more charisma then most live action movie characters so far this year. I’m not a huge fan of the animated genre, I have a hard time relating. But Wall•E had my attention for its entire two hours. I laughed (out loud) and even got a little choked up toward the end.